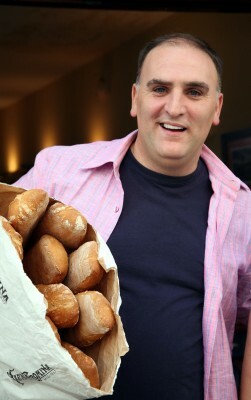 Raise your hand if you have a bigger foodie crush on Chef Jose Andres after catching him on 60 Minutes with Anderson Cooper last Sunday? Want a chance to meet him *and* get a taste of the giant paella he's cooking up today, head down to the White House Farmers Market today from 3-7pm. It's on Vermont Avenue just across from Lafayette Park. Word on the street is that the White House Farmers Market is even bigger and better than last year. Check out this list of vendors that will be there today... get down there, say hi, and scoop up some local ingredients to fuel your weekend menus! PS. Last year, at the launch of the White House Farmers Market, I discovered @Shaw_Girl and @UrbanBohemian on Twitter. They've since become great friends and amazing inspiration for blogging and learning about food and local ingredients. Check out their blogs, Adventures in Shaw and Urban Bohemian.